Crafting When I Can: 1 picture, 2 awards. 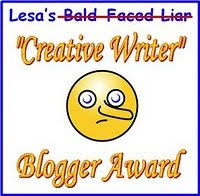 I was awarded this award by 2 lovely and talented ladies Lorraine and Ildz, please hop over to their blogs, you won't be disappointed. I have to post, link and thank the person who gave it to me so THANK YOU, Lorraine & Ildz. I also have to pass it onto 7 people, this is the hardest bit as I really enjoy visiting everyone's blog (or I wouldn't have such a long list and no time to craft). Anyhoo here goes. I have tried to give an award to all the people who regularly leave me some encouragement and who I haven't passed an award to before. Please don't be offended if I have missed you out. (This is why it always takes me ages to post awards so far I have been at this an hour and I have only chosen 7 blogs). I have tell the above they have a little something on my blog. I now have to tell 6 lies and 1 truth about myself. 1, I am a size 10. 2, I own 3 dogs. 3, I craft on a board on my knee. 4, I drive a Ford Focus. 5, I love watching reality programmes on TV. 6, I own a Caravan in Cleethorpes. 7, I used to sing on the Northern Club circuit. Will you guess which is the truth? I may/might (don't know which is grammatically correct) let you know on my next post. Ooooh, there all so believable! Can't guess which one is the porky pie!! Thanks so much for the Poppet that is kind of you to think of me.